the very thinly potted deep cup with wide ﬂaring lip, supported on a high hollow stem with pedestal foot, the stem with large central knop pierced with three rows of thin vertical slits, the rounded sides of the cup decorated with regularly spaced shallow horizontal grooves, the black pottery with glossy smooth burnished surface and with traces of earth from burial remaining. A Longshan black pottery cup with a similar pattern of vertical slits on the stem was excavated at Sanlihe, Jiaoxian county, Shandong province in 1974–75 and is illustrated in a line drawing in Jiaoxian Sanlihe (Report on the Excavation of the Sanlihe Site), Beijing, 1988, p. 111, ﬁg. 62:2. 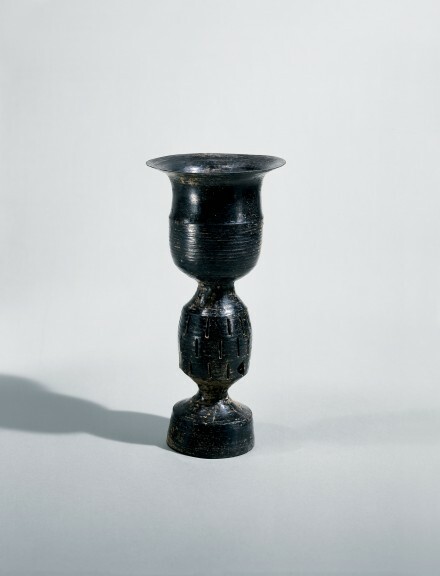 Another closely related black pottery stemcup excavated in 1976 from a Longshan site at Chengzi, Zhucheng county, Shandong province was shown in the Inaugural exhibition at the Sackler Museum, Beijing University, and illustrated in the catalogue entitled Treasures from a Swallow Garden: Inaugural Exhibit of the Arthur M. Sackler Museum of Archaeology, Beijing, 1992, no. 30; and another with sharply angled contours identiﬁed as from either the Longshan culture or the slightly earlier Dawenkou culture, is illustrated by Krahl in Evolution to Perfection: Chinese Ceramics from the Meiyintang Collection, London, 1996, pp. 14–15, no. 5. Other examples of similar form with pierced circles and triangles on the central knop are illustrated by Medley in The Chinese Potter, Oxford, 1976, p. 25, ﬁg. 12; and by Valenstein in A Handbook of Chinese Ceramics, New York, 1989, p. 14, ﬁg. 13.